Chace was born July 18 1985. He grew up in Texas. He graduated from Trinity Christian Academy in 2003. He is 6 foot tall. Has a younger sister named Candice. Voted 'Best Dressed' his senior year of High School. His younger sister, Candice, is Miss Missouri USA 2008. Although he worked as a model in Dallas, he never pursued acting. He moved to Malibu, California to attend Pepperdine University after high school where he was a member of the Sigma Nu fraternity. I remember first seeing Chace in the movie The Convenant, which I own the dvd of. He was recently in the movie The Haunting Of Molly Hartley. But Most of us know Chace from the CW show, GOSSIP GIRL!!!! Chace also won the hottest bachelor in People Magazine this summer! Oh Nate Archibald, why do you have to been seen with Blair or Venessa, why not come see me??? I'll let you be my boyfriend any day of the week!!!! He is a major cutie. Nice choice. 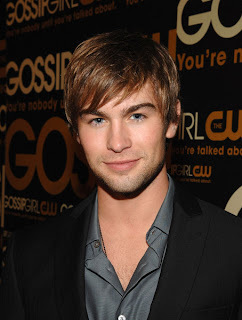 Chace Crawford is all kinds of yummy!! He's is absolutely gorgeous and I like him on Gossip Girl, but I adore Chuck.